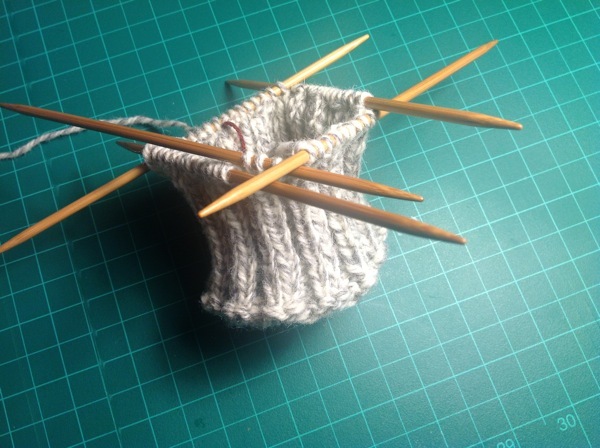 … I turned 55 and started knitting, because I wanted knitted wool socks. I never realized that knitting would be like sitting meditation with a tangible outcome. My knitting education began on the internet and moved to locals willing to share there time and knowledge. KnittingHelp.com became my first resource and their videos explained in detail every stitch and pattern I needed. I started learning Continental style and Mimi Fautley at The Loop Craft Cafe in Halifax taught me Norwegian style Continental knitting. Above is my knitting stash. It is always small, because I only buy yarn for specific projects. My first project was a pair of fingerless gloves that I felted. Next was a scarf that I restarted the first three inches over 20 times. By then I had K2 P2 (knit 2, purl 2) ribbing down pat. I finally tired of the boring gray color at about 36”. 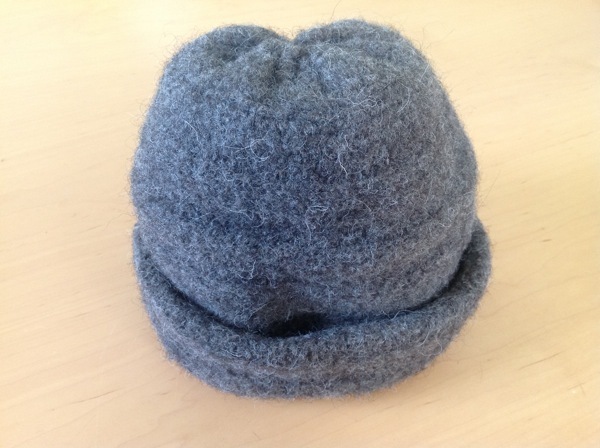 So I turned the scarf into a felted hat, I was encouraged by the success of my gloves, but made one mistake. I used hot water cycle on the washer rather than warm as I had before and in no time I had a hat too small for me to wear so I gave it to a dear friend. It was time for a pair of socks and Heather and Angela from Have a Yarn helped me select a great yarn to start. The socks continued on for several months, a little more every time we watched a movie. Meanwhile my head was still cold so I started a new hat and wanted to add some colour (rather than black and gray) into my life. Then I was introduced to Sharon Orpin and invited to join her and the ladies at the Friday knit and spin at Sharon’s Studio. I wanted to learn to drop spindle and Sharon got me started immediately. 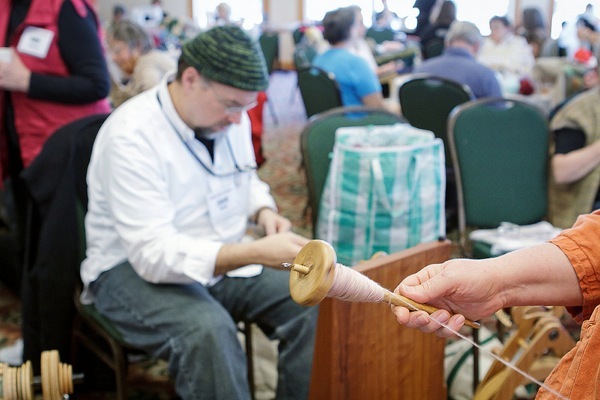 Went to the Maritime Fiber Arts Retreat at Oak Island Resort with 250 other fibre people and had a great time spinning. Even left with a small skein of yarn. The IWK asked all knitters in the province to knit some Purple Hats for the neonatal unit. So I participated. The Lunenburg Library sponsored a knitting day and a number of us participated in knitting over 70 hats to send to the IWK. One hat is never enough, so I knitted a second for myself. 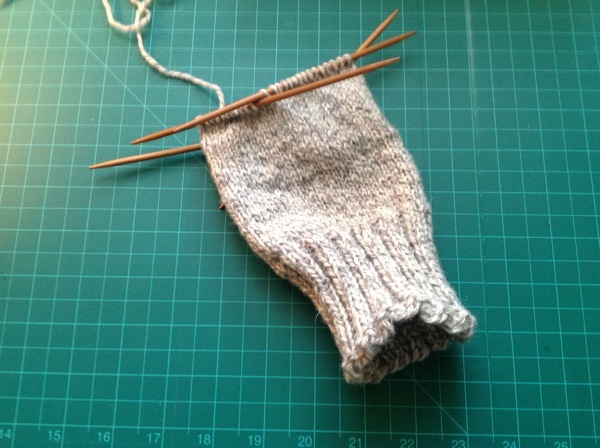 I started knitting a new pair of socks for me. Pamela wanted socks for Christmas, so I finished her a pair. She really likes them. Now wants another pair. Then I made a pair of fingerless gloves from the leftover yarn from my red hat. Now I finally finished one of my red socks and am finishing the other sock. My big project for the spring is the Double Knit Paint Box scarf by Lucy Neatby. 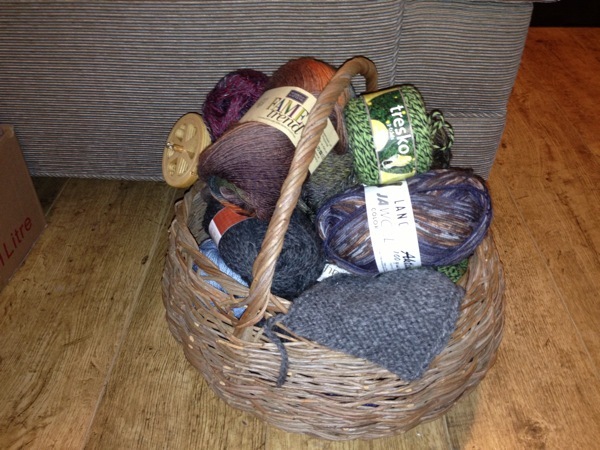 I attended a workshop with her at Have a Yarn and decided it would be my next challenge. It requires concentration so works best when I have an Audible book to listen to and just sit down and knit. Completed it will look something like this…long and colourful. There are so many fine knitters who have helped me throughout the year. Elly showed me how to make double knit needle holders. 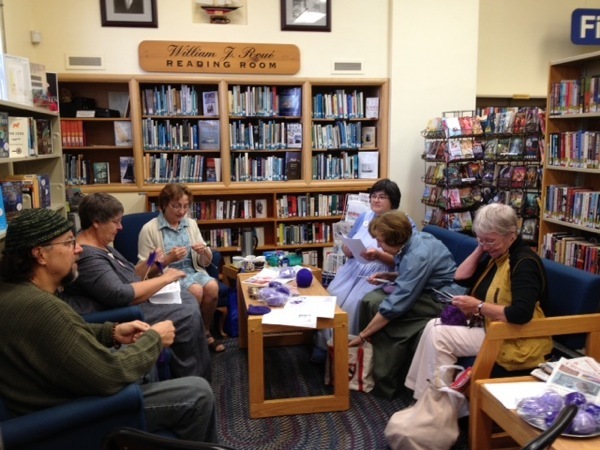 Michelle and the knitters at the Makery welcomed me into their circle. The Biscuit Eater and Sweet Indulgence were great places to sit and enjoy a cup of tea and knit. I wish I could remember all the names of the knitters and spinners I met this year, but I cannot thank them all other than to say, Big Hug to all.